iMacros was designed to automate the most repetitious tasks on the web. If there’s an activity you have to do repeatedly, just record it in iMacros. 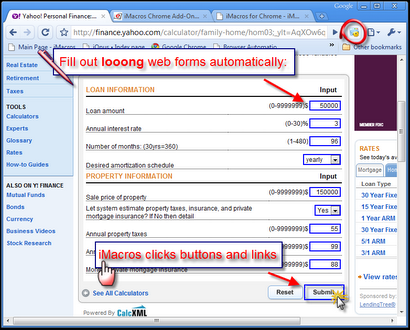 The next time you need to do it, the entire macro will run at the click of a button! With iMacros, you can quickly and easily fill out web forms, remember passwords, create a webmail notifier, and more. You can keep the macros on your computer for your own use, use them within bookmark sync / Xmarks or share them with others by embedding them on your homepage, blog, company Intranet or any social bookmarking service as bookmarklet. The uses are limited only by your imagination! => Tip: After the installation go to http://www.iopus.com/imacros/chrome/ and run a few of the embedded sample macros. You can run these macros right away - no browser reboot is required. Popular uses are as web macro recorder, form filler on steroids and highly-secure password manager (256-bit AES encryption). Web developers use iMacros for web regression testing, performance testing and web transaction monitoring. 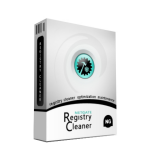 It can also be combined with Google Speed Tracer, Firebug and other web development and test tools. XPath support is included. iMacros can be combined with Greasemonkey style content scripts and the macros can be started via the command line e. g. via the Windows task scheduler, batch files or a Linux cron job. You can combine iMacros with ad-blocking extensions like AdBlock, FlashBlock and AdThwart to speed up the web browsing. It does not work in IE Tab, but for IE we have iMacros for Internet Explorer. Screen capture support will be available soon. Macros recorded with iMacros for BlackHawkcan be replayed in iMacros for IE and iMacros for Firefox without changes! All iMacros versions combined have millions of active users, making it the most popular web browser automation tool. Copyright © 2003-2011 NETGATE Technologies s.r.o.